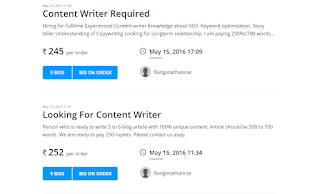 If you are a content writer looking for writing assignments or a website owner looking at purchasing high-quality content writing services, then the search can be quite daunting. While many content writers struggle to find well-paid jobs, clients also have to look everywhere in search of quality writing services. Content writing platforms are the best way to bridge the gap. While there are quite a few such websites in place, finding one that has transparent billing methods and quality services is not easy. So, if you are also looking for a content writing platform from where you can outsource all your content needs or a website through which you can get regular content writing jobs with payment security, then you are at the right place. Today we are reviewing one of the leading content writing platforms Content Mart. While the platform works much like other outsourcing platforms such as Up Work or Freelancer, this one is specialized for content writing services only. Before we start giving you our views and verdicts on the platform, let us give you a clear idea of how the platform works. How Content Mart Works for Clients? Posting your content writing requirement is pretty simple through Content Mart. As a customer, you’ll have to register yourself with Content Mart first. The registration process is absolutely no nonsense, and the best part is you don’t have to provide any credit card details while registering. Just go to the Content Mart website and click on the Register button. A pop-up will open asking you to register as a Writer or Client; choose Client and the below page will open up. 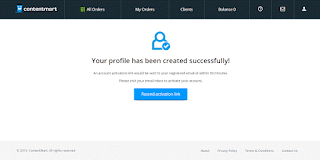 As you can see, you can register by proving your email and setting up a Nickname only. If this feels too much, you can register with your Facebook profile too. Fill the details and click on Register Now, and you have registered yourself as a client with Content Mart. Now, using the New Order tab you can place any content writing the order that you may need. However, to place any new order, you’ll have to recharge your wallet with the order value you are offering. This process is pretty simple too. You can recharge using PayPal from anywhere around the world, or can use Net Banking if you are based in India. Content Mart would release the payment to the writer only once you have accepted and approved the written content. In case if you’re not satisfied with the content written you can send the work back to the writer for rework or can even reject the work if it is not on par with the guideline. As a client, you don’t have to pay any commission or service tax to Content Mart. You pay for what you get only. How Content Mart works for Writers? Content Mart is equally easy to use for writers as well. To get work from this platform, you have to register as an author first. Simply head to the website and click on register and you’ll get a pop-up to asking you to register as a client or a writer. Choose author and same as the customer; you’ll reach a page asking for registration details. As you can see, Content Mart will send you a verification mail on your registered e-mail id. Once you click on the activation, link your account will be activated. Once activated you’ll have to set up your account by proving necessary information about your age, education, work preference, etc. You can also upload a work sample for the perusal of potential clients. Just choose the ones you think you can work on and bid for it. Once the client accepts your offer, you’ll have to write the articles and submit. The customer has 5 days to review and accept/reassign/ reject your work. In case the client does not respond after submitting work, the work gets auto-approved by Content Mart, and you get paid for the work. So, your payment is entirely safe and secure. The website charges 10% commission on your total billing and allows weekly withdrawal for any amount equal to or above INR 3000. You can get the money directly to your Indian bank account. After reviewing Content Mart from both Client and Writer viewpoint, we think it is one of the best content writing platforms you can work with. Why? Here are the reasons. Why should Clients love it? No commissions to be paid. Most other similar platforms charge a hefty sum to the clients as registration fees or membership fee. However, this is one platform where you pay only for what you get. A large number of quality writers is available here. So, for any order, you can expect multiple bids and choose the candidate best suited for your work. All the writers are graded by their English grammar knowledge and also rated by previous authors. So, you can have a pretty good idea about the writing skills of any writer before hiring him/her. You have the freedom to accept work or sent to back to the writer for further work. In case you are not at all happy with the work, you can choose to reject the work as well. So, you’ll never have to pay for any work that you are not happy with. Why should Writers love it? This is the best platform for Indian writers, as you can charge the client in INR and get the money directly to your Indian Bank account. No third party gateway is needed. Totally safe and secure billing. Once the customer assigns work to you, the billing amount gets locked with Content Mart. So, even if the client becomes unavailable after submitting the work, you get paid. Due to the no-commission policy for a customer, you get a large number of clients and thus more projects to choose from. Unlike other freelancing platforms, this one is dedicated to content writing only; so you don’t have to meddle through thousand other irrelevant orders. After going through all the points above, we just love Content Mart. 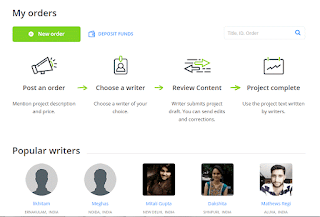 Honestly, if you are an Indian content writer and looking for a fuss-free platform to get freelance writing projects, this is one of the best platforms available to you. The billing process is totally transparent, and you can receive a weekly payout. As for the clients, this is one of the very few platforms where you get your job done without paying a commission. Need we say more? So, if you are any way related to content writing, we would totally recommend you to try out this awesome platform. You can register yourself here. And do let us know your Content Mart experience.